CHARM IT! is the original, detachable "I just can't stop smiling" charm jewelry brand for girls ages 5 – 14 and offers charms in every category from fashion to music, animals, and special interests like ballet and gymnastics to co-branded charms including Hello Kitty and Disney. CHARM IT! is available at specialty boutiques worldwide, as well as at Nordstrom, Saks, and Gap Kids and makes a great gift for any occasion – birthday, lost tooth, recital, or just because! CHARM IT! sent two bracelets + 5 charms for Lilyana and Sophia..
Sophia's bracelet - Minnie Mouse because she absolutely loves Minnie, Cotton Candy charm since it's one of her favorite things to eat, the letter S for Sophia, Puppy because she's in love with dogs, and last Bubbles because she is OBSESSED with Bubbles! Lilyana's bracelet - I love Dance charm because she LOVES to dance (Jazz and Tap), Treasure Chest because she's always digging in the dirt, Ariel Heart charm because Ariel is her favorite princess, the letter L for Lilyana, and last Hello Kitty because she loves Hello Kitty, pink and sparkles! Lilyana and Sophia love there new charm bracelets! They can't wait to get new charms for it! I love how each charm has a meaning behind it, and I love that I'll be able to purchase more to add to there collection for different occasions or important events! Every little girl needs one of these bracelets, they are fun, colorful, and meaningful. And GUESS what?! CHARM IT! Guest designers WANTED! 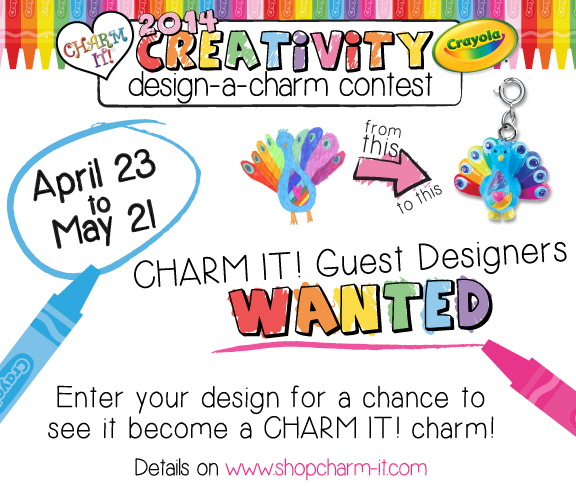 CHARM IT!, the creators of the original, detachable girls jewelry is on the hunt for the most creative, imaginative and unique designs to add to their 2015 CHARM IT! Collection! If you are under the age of 14 and have ever dreamed of adding fashion designer to your resume, here is your chance to submit your original art work to one of the worlds premier youth fashion jewelry lines out there! CHARM IT! is carried exclusively at specialty stores as well as GAP kids and Nordstrom nationwide. Just imagine walking into one of these national retailers and seeing your design on the CHARM IT! display! In addition to the title of Guest Designer, the 12 winning artists will each receive $100 gift certificate to use on www.ShopCHARM-IT.com as well as a donation made by Crayola to the amazing organization, Art Start in their names. For official rules visits www.shopcharm-it.com/contest to download the entry form, complete rules and guidelines! CHARM IT! is giving one of my lucky followers a bracelet and 5 charms of your choice!! How awesome is that? One (1) winner will receive: A bracelet + 5 charms of your choice. Ends 5.13.14. DISCLAIMER: All products received are complimentary for testing purposes from CHARM IT!. All opinions stated are my own and are not influenced by any affiliates. The animals charms are absolutely adorable. They're all extremely cute. I think I have to go with Hello Kitty as the best. My daughter is into charming.. she does some crazy things with them. Anything to accessorize that sparkles is perfect for my little miss!!! My daughter would love that! She just started playing with play jewelry. My daughter loves these! I like all the Disney charms. My favorite charm is the princess crown from the princess collection. :) Hope to win! This would be great for my niece and her friends. How beautiful! My little sister and niece would love these! I used to have a charm bracelet when I was little and loved it! Charms are so much fun! so adorable... is the #giveaway open for all countries? OMGosh I would love to design one! Or to have one designed by one of my kids. That would be such a cute keepsake! I LOVE THE CEREAL BOWL! Hard to choose a favorite but I THINK my fave is the rainbow open star. I love these! My favorite is the glam girl gift set. I love the two peas in a pod! The bracelet would be perfect giveaway among friends. Aww these would be so cute, what a lovely giveaway! My favorite charm is the pink soccer ball because, I would give this to my granddaughter and she plays soccer. The Hello Kitty Beauty Charm is my favorite! These are so cute. I love them all! I wish I had a daughter now. Oh well, I have a niece. Charm Bracelet are really nice but why it is so unfair that they are made only for girls out there. I am gonna join the GA and nice review here. If I will get this bracelet I will surely wear it. My favorite is the grandmas girl charm. The Bulldog charm is my favorite. Love the Belle Heart charm! My favorite is the Minni Mouse Charm. Ok, seriously way too many to pick only 1 favorite, but...anything Disney, I love the little princess hearts, the eiffel tower, the flamingo, the panda, the "hot dog" so totally cute! I love the baby penguin. I love the letter "A" since it would be for my niece, Abigail!